This is the first installment of a three-part series. Deliciousness is subjective. To some, Budweiser has a repugnant flavor and an aftertaste that makes one reach for coarse sandpaper to scrape one's tastebuds off. Others like it. Some find an Islay single malt a good match with barbecue and will drink it even if it risks one's wife avoiding kisses for 48 hours. Others don't like it. So you should let your mouth and tummy guide you where my simple math dare not tread. But I will discuss quantitative decisions that can accompany one's drinking choices. I've included a link here to the Google Docs file on which the screenshots are based. Someday, perhaps, Google will allow bloggers to insert Google Docs into Google Blogger. Right. Part 1: How much alcohol is in your alcohol? Ethyl Hydroxide is a protoplasmic poison that can be metabolized at a rate of approximately 0.5oz per hour. When consumed at a greater rate than this metabolization, it enters the bloodstream where it then affects synaptic transmission. Therein lies the magic. It is from this metabolization process that the American Medical Association, state highway patrols, and I get our official single serving of alcohol: 0.5 fluid ounces. You may notice a few things here. Firstly, the prevalence of the blu-ish and brown rows at the bottom of the table, showing more alcohol per serving. These are the spirits. 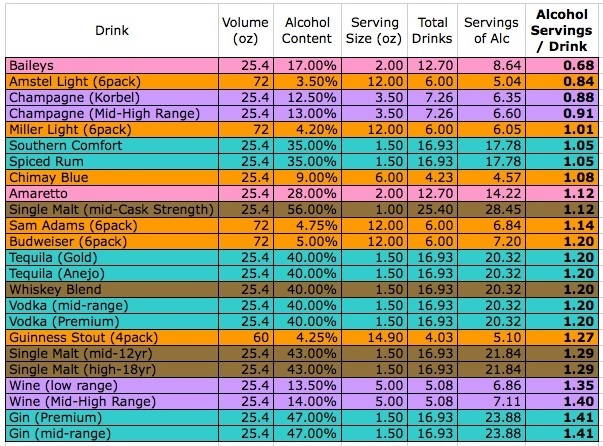 You'll also notice Bailey's way up at the top with the lowest alcohol per serving. You may wonder, why isn't its serving size larger, like 3 ounces? That mystery will be solved in Part 3. The argument can be made that the listed serving sizes -- while considered standard by bartenders, calorie counting programs, and general etiquette -- are arbitrary when the drinker is at home. "I can pour me a double whenever I like," one may say. That's fair. But there's only so much booze in your bottle, as per the "Servings of Alc" column. Champagne, light beers, and some liqueurs have one standard serving of ethanol per pour, or a little less. Spirits tend to have a little more. Example: Five shots of vodka (ugh, flashback) equal six servings of alcohol. If you're popping open a beer, then you're getting pretty close to a 1-to-1 ratio. That good bottle of Cab sitting on your shelf at home may hold just five glasses of wine but it has seven kicks of ethyl. Or if you're pouring spirits at home, the higher the alcohol content (even if the difference looks minuscule), the more buzz in your bottle. So take another look at the table in the picture, peek at the Google Doc, or let me know if you'd like the mini-spreadsheet. There's more fun where that came from. Feller, Robyn. The Complete Bartender. New York: Berkeley Books, 1990.